TattooRunner: Road, rewarding and rattyness! Well another Gold Coast Marathon has been run and won (not by me!) and as much I was not really looking forward to a whole 42.2k on the road, this turned out to be one of the most rewarding and enjoyable runs I have done. The reason for this? The reason is that I did not do the run for me, I did it for two other people. It was my dad's 10th Goldy Marathon so it was a very exciting time for him and great that we could do it together! Our annual pilgrimage to the Gold Coast with my wife, mum and grandma happened yet again. My aunty and uncle are also regular supporters. My dad is a superstar and even though he did little to no training since the North Face (due to injury, not lack of wanting!) he still finished easy and paced another first time marathoner from Bundy. Me offering Mandy a little 'encouragement'! This leads to the main reason for my personal reward at the Goldy...pacing! I made a decision about two to three weeks before the race that I would help one of my training buddies Mandy who was running her first marathon. She had done MORE than enough training but lacked the most important asset in long distance running...the few inches between the ears (MENTAL STRENGTH!) So I decided to give her a hand. Now once we dealt with, and dealt with again and again Mandys thinking she would slow me down, not enjoy it etc, race day fast arrived and it was go time. From the outset she did a great job however approaching 30k, started to fall in a hole. The sun came out, the legs got tired and the negative thoughts flowed freely! To cut a long story short, I stuck with her and we plodded our way to the finish. Mandy showed fantastic spirit and courage to continue on and she should be VERY proud of her efforts, as should all those involved in the full, half and 10k events! We finished in 4hours 34minutes with massive smiles on our faces and hugs all round! 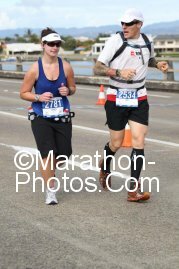 This marathon was my slowest by about 35-40minutes but BY FAR my most rewarding. To help someone else achieve their goal in a small way made the weekend very special! Good times! So, I think for now the road marathons are on the back burner. I look forward to some upcoming off road/trail events and the long hard slogs in the bush. This weekend was a eye opener for me also at how important mental strength is in what we do. As ultra runners, our minds are so hardened and determined to the goal at hand that nothing seems impossible. This acts as an overflow into out everyday life also and I reckon makes us stronger, more productive, energetic people in all we do! I wouldn't want it any other way! So, over all, well done Dad, Mandy, all the Bundy runners, and everyone else who took part in the weekends events. I am sure that you all have your own personal journeys to tell about and I hope to hear them! Run on friends and catch you soon. Thank you Mat for sharing both your time (in training runs and the GCM) and thoughts. I want that mental strength and YOU and YOUR DAD have inspired me to go get it! If ultra running is what it takes, then... I'll JUST DO IT!